Extremist parties do not work in the United States. Run for office as an extremist and you will lose badly, making your cause look less popular than if you had not run at all. This is counterproductive. If you want to push radical ideas, running for office is the wrong venue. Nonetheless, the longest running minor parties are very radical. Radicalism may be a mistake, but it serves the organizations. Passion is powerful. The more passionate your activists, the harder they work. Passion correlates strongly to radicalism. Radical party members tend to be show up for meetings and write checks for campaigns and office space. Political parties which make their radical members happy survive, even if they serve no other useful purpose. This is why we have zombie third parties which run failed campaigns year after year. 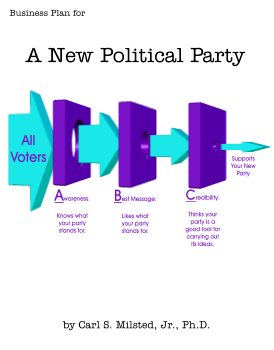 For those of you who want a new political party which serves a useful purpose grok this: Voters tend to vote for the candidates with whom they agree. A candidate near the center will have more voters in agreement than a candidate off in the radical fringe. Consider a congressional race in a liberal district. Suppose the radical liberal elements decide to run a radical socialistic Green candidate. Meanwhile, the conservative minority gets behind a barely conservative Republican. And to make it easy for our Green candidates, let us suppose there is no Democrat in the race (because the liberal activists got behind the radical Green). If the voters vote for the candidate closest to their views, the Republican wins! We have the converse scenario with a hard-right Constitution Party candidate vs. a moderately liberal Democrat in a conservative district. The Constitution Party has the ability to elect a Democrat in what should be a safe Republican district. In either case, going with the radical party produces election results in the opposite direction of the radical party’s goals! For this reason (and others) most radical liberals hold their noses to support moderate Democrats and most radical conservatives hold their noses to support moderate Republicans. This is actually one of the beauties of the American political system: it keeps out the wackos. With district based winner-take-all elections you have to be close enough to the center to be in the mainstream somewhere. This way we get legislatures sufficiently united as to be able to conduct business. With proportional representation commies and fascists can get elected. Remember Adolf Hitler. Giving the fringe a seat at the table produces rancor in the legislatures, Third World style politics. Dictatorship becomes tempting. That said, we still have quite a bit of room for passion and principle in our system. Districts vary. A politician who would be considered a radical leftist by most can still be considered mainstream in places like Berkeley California. Furthermore, the model I used in the figures above is approximate. Even in two-way races, people do not vote purely for ideological agreement. Some liberals in the liberal scenario above may well vote for the radical Green candidate in order to offset the conservatives in other districts. The converse holds for conservatives in the second scenario for the radical Constitution Party candidate. Such sophistication is nowhere close to universal, however. According to my observations in the field voters in the middle generally go with the candidate closest to their view with little regard to the impact on the total legislature. Back when I was active in the Libertarian Party I tried a bathtub metaphor with moderate libertarians. (If the tub is too cold, you add unpleasantly hot water in order to bring the overall mixture to the desired temperature. A radical libertarian is like the hot water.) It didn’t work. Also, some votes are won for reasons other than ideology. People vote for experience, good morals, good looks, pork, special privileges and/or simple name recognition. And many people don’t bother to vote. Passion makes voting worthwhile. It is easier to get out the votes of your radicals than your swing voters. For these reasons it is sometimes possible to get away with being a bit more radical than the ideology diagrams above would indicate. Combine this with district variance and you have room for a party with ideas and a platform with teeth. But there are limits. In my conversations with many Libertarian activists, I have encountered many who would deny that Rule 1 has much of any importance. They tell me that platforms don’t matter, that people don’t read platforms, that it’s just about money, publicity, name recognition and getting out the vote. Whereas a new party need not appeal to 50% of the voters overall, it does need to appeal to well over 5%. 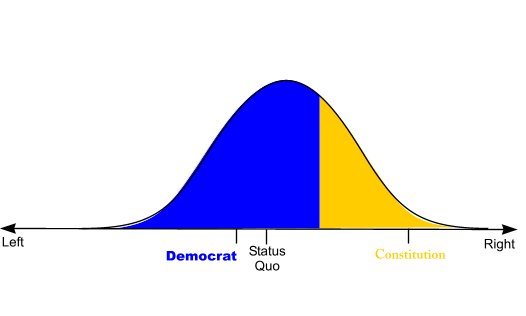 As a rough first guess, I would suggest that a new party should position itself at around the 80th percentile along its scale of values; that is, 20% of the voters should be more radical than the party’s position. This should provide at least 5-10% of the voters who are less radical but are still closer to the new party’s position than they are to the major party positions. Throw in district variance and you have a majority position somewhere. You might get away with being a bit further out, possibly out to the 90% percentile overall. Doing so can increase passion, which is useful for acquiring early adopters, but it also loses mainstream votes. For comparison, look at the percentile scores of the existing third parties. Prior to the 2006 reforms, I would say that the Libertarian Party had positioned itself above the 99th percentile on the small government scale. That is, less than 1% of the U.S. population was more radically libertarian than the Libertarian Party. With the new 2008 platform, the party might be down as far as the 95th percentile. However, there are still some pretty radical positions in the platform, deal-killers for most people. Post 2008, I have not kept up with the LP platform. I suspect it has been re-radicalized since I left, but I leave it as an exercise for the reader to verify. 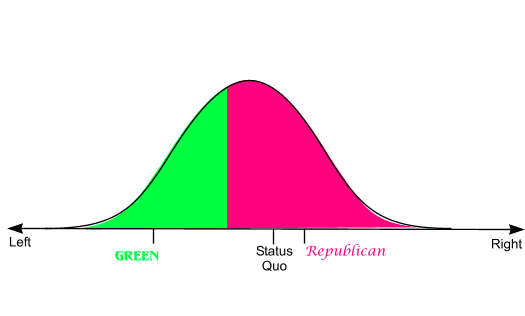 Likewise, I leave it as an exercise for Green and Constitution Party members and fellow travelers to determine what percentiles their parties are positioned at. Rule 1 for third parties is an easy rule to describe, and a hard rule to stomach for many with the passion sufficient to support a minor political party. Fortunately, Rule 1 does not rule out a quest for utopia. It merely rules out utopia in one political term. With each small success, the next steps become less radical. Alas, a “Party of Principle” unwilling to advocate those small never gets to make its long term goals mainstream. Now the more bad news: moderation alone is not enough. Rule 1 is but the first of three rules a third party must abide by to be successful.